It can sometimes feel as though we spend, and share our entire lives online. It is so easy to access information now with smart phones, and free wi-fi in most places that we surround ourselves with technology. Technology can be an amazing tool, but what if you want to unplug and spend time away from a screen? A recent survey by Cartridge Save found that 65% of people want to take time away from the internet and their phone at some point. Whilst some people enjoy baking in their tech free time, others enjoy gardening. I personally like to spend my non tech time with my husband and daughter, as most of my hobbies include being online. I like to think there are plenty of activities that don't involve anything digital, yet can also include someone else, so I thought that today I would share 5 activities that I enjoy with my husband away from the screen. Have you ever just jumped in the car and driven around with no particular destination in mind? It's something that my husband and I used to do on a regular basis. We would take it in turns to pick the next direction. Sometimes we ended up in the middle of nowhere, even a little bit lost, but we always had fun, and we always managed to find a way home without even using our phones. In fact we've even used an old school map before! We've found some lovely country pubs and new places to visit by doing this. It's a lot harder now that we have a toddler, but when she is napping in the car we still sometimes set off with no destination in mind. I love a good board game night, and it's something my husband and I try to do once a week when Elise has gone to bed. We turn off the television, we put our phones to one side and we just enjoy a game of scrabble. Not only does it develop our vocabulary, but it also creates plenty of opportunity to laugh and just enjoy each other's company. We keep a tally of who wins, and then at the end of the year the person with the most wins gets a lovely treat. It's worth checking out some local cafes and restaurants too for playing board games. Some host game nights, and one of the cafes near us has board games out that you can play anytime. Perfect for a lazy afternoon! For both my husband (who is a spreadsheet geek usually) and I, sometimes planning can be just as fun as the activity you are planning for. I started keeping a bullet journal around a year ago, and really enjoy jotting down ideas for day trips in there. I find it the perfect break away from technology, and it is something that both my husband and I look at. Writing things down in a notebook is just so satisfying to me. Yes, we do keep a record on the computer too, but I love both sitting down and jotting ideas, and planning our week on paper too. We are also pretty happy making a good list. Being able to tick things off once you have completed them is just so much more satisfying then deleting them off a phone. Creating doesn't have to be arts and crafts or sewing. The kind of creating we love to do together is of the music variety. We love getting together and learning a new song, or having a sing song. I must admit, I'm not as great as Steffan, but we have a good laugh together. It's also something that Elise can get involved in. She's already showing a huge interest in music, and I think it is because she sees how much fun we have creating music together. We are definitely a musical family, and I love that we can share a passion together. We also like to check out free music events that are put on in the local area. The season for this is just about to start, so I'm sure you'll be seeing some photos of this on my blog and social media. It's been a few years now since we adopted our greyhound Chloe, and we adopted her from a greyhound rescue centre. Since adopting Chloe, we've also fostered a few dogs who needed some help, and we've also been to walk dogs at the local greyhound centre. It is so much fun to go and help out, and the charities really appreciate it. These dogs deserve all the love in the world, and simply taking them for a walk makes their day, and can even make your day too. Some dogs are in rescue centres for a long period of time yet they still get so excited about any human contact. Trust me, this will be one of the best experiences of your life, and it doesn't cost you a penny. 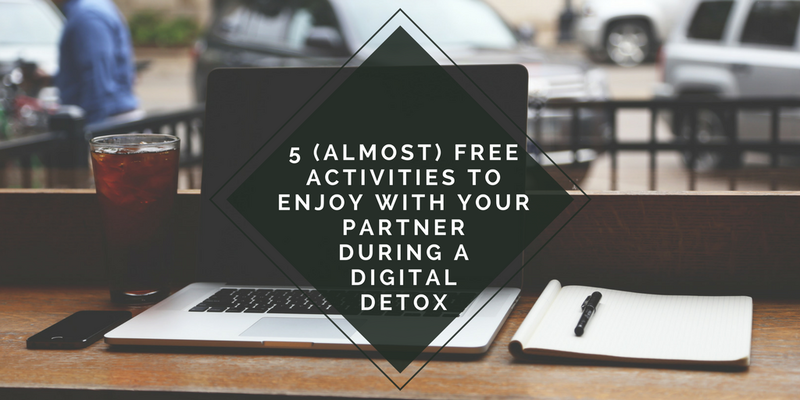 So there are 5 almost free activities that you can enjoy with your partner whilst staying away from the technology. I say almost free because taking part in these activities may lead to you spending some money whilst on your adventures...they can be as cheap or as expensive as you want them to be. Do you ever want to take time away from technology? Follow Information from a press release by Cartridge Save. For more information on the research, please visit Web Gazette. What a great post! Aimlessly driving and stumbling upon new places is always a fun idea, especially with your significant other! I love these suggestions! Board game night is something we do regularly with another couple and we have a blast! We try to go out and do something fun at least every weekend. Another great idea that we love is bike riding. While technology is great, it is just as great to have these detoxes every now and then. Great post! I love boardgames! And I am happy that they are becoming somewhat fashionable. I have no siblings and always wanted ti play boardgames but did not know anyone who would like to play them too. Now as an adult boardgames are becoming popular and I was able to find colleagues at work who like to play too, yay finally! Simple lifehack to prevent runny nose: link. These are all great ideas! I'm going to try some out with my husband. We definitely need a digital detox! I always forget how fun board games are. We keep ours under the couch, so they never come to mind when we are looking for something fun to do at home. I think I'll break out Monopoly tonight after dinner! Thanks for the suggestions! Driving aimlessly is a fave of mine! I do have loads of board games though, I may try that. Thanks for the suggestion! Love these options so much! I think a digital detox is such a great thing to do! I love boardgames :) I think a digital detox is a good thing to do . Find an activity outdoors. Go for walk, do some gardening. The electronics will always be there when you return. Awesome ideas. I feel my husband I need to be more creative outside of electronics...will have to try some of these ideas. I really love these, such fun ideas. My fiancé and I love going on drives through the canyon and we just stop at random places, we always have the best times! Great inspiration and I definitely need a digital detox sometimes! I do love to garden but for couple activities, we really like to visit new places around Ireland and have a good walk and a nice cup of coffee and discover new places of interest. I love going for drives! Often we come across things we may never had discovered. We do this with my kids too! They love it! I love these ideas! We also enjoy cooking together! Driving with no particular destination sounds awesome! These are all great suggestions! I feel that it is healthy to detox from digital things everyone once in awhile. It's so refreshing! I love playing board games! Also I am a huge animal lover, so volunteering at a shelter is right up my ally. These are great suggestions. My fiance and I always used to drive around aimlessly, we should do this again sometime soon. A digital detox sounds so refreshing. Great post! When I unplug, I like to journal, driving and getting out the house is a good idea too. Really great suggestions! My husband would love for us to get in the car and just drive! The first one is what we do often - hit the road with a fun snack (usually ice cream!) with no destination! This is so necessary and helpful! Thank you for sharing!! These are such great ideas. It's sad that we need these tips though but it's just the way our world is with this onset of the digital age. My Hubs and I are connecting more with working out together. Thanks for sharing!! We'all definitely take advantage of these ideas and start doing digital detox. These are great ideas! I especially love the idea of volunteering and board games are always fun! Great suggestions. I love the board games one! I love all these ideas! Surely going to suggest them to some people I know! Thanks for sharing. We do crafting stuff as a weekend family activity.It's great fun too.Lovely post . I love Board games but no one is ever available to play them with me haha! That sounds so sad. Oh well! Apart from that, I love to write and read. They really help me to stay away from the tech for a while. I love the idea of volunteering at an animal shelter! My husband and I are both big animal lovers, so this would be an awesome way for us to spend some quality time together, love on some pups, and do something good! Thanks for sharing! These are amazing ideas. I am definitely going to suggest a random drive. I've seen giant adult colouring sheets before which would be fun to do together.